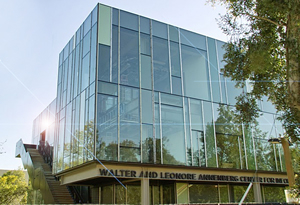 On October 30, 2009, the Annenberg Center for Information Science and Technology officially opened its doors. The building now houses most of the members of the CMS department. Windows proliferate inside as well as outside: this ubiquity of glass allows sunlight to shine in from a spacious, two-story central atrium, flooding every office with the light that’s often rare in other structures—no grad students toiling in dungeon-like basements here. Fresh air also flows into the building through operable windows in nearly every office. 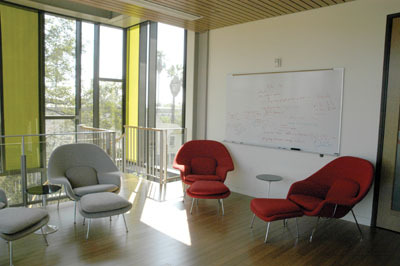 Natural light and air make Annenberg a comfortable place for contemplation and collaborations—one of the guiding principles behind the center’s architecture. And the rich wood paneling found throughout the building is not only pleasing to the eye, but is actually bamboo—another sustainable material. Office doors are slightly recessed, leading to jagged hallways that avoid the institutional, sterile feel of seemingly infinite corridors. Along the hallways and in corners, chairs and small tables beside whiteboards stocked with markers encourage impromptu discussions and fresh ideas. Tables and chairs scattered on the terrace on the north side of the building invite people to sit and linger, and there’s even an outdoor blackboard at the building’s southwest corner for scientific debates. The building was designed by Frederick Fisher and Partners. Aesthetically, the building echoes the architectural rhythms of the campus. The outdoor stairways reflect the styles of Spanish architecture (as an added bonus, they save more money by not needing walls and a roof around them), as do the repeating window patterns. The green exterior mimics the hues of olive leaves on the trees that dot the campus. But the building is green inside and out: the Annenberg center received gold certification under the Leadership in Energy and Environmental Design (LEED) rating system. Our department also occupies the Steele house, situated right next to the Annenberg Center along the Moore Walk. After being the headquarters of undergraduate admissions for years this cozy house, once famous for its huge built-in pipe organ, now provides a convivial place for the CMS researchers to work in.